Slow and Fast Frequency Hopping in GSM, hopping between the mobile and the base station, frequency hopping, carrier frequency, hopping, burst. Frequency hopping can be briefly defined as a sequential change of carrier frequency on the radio link between the mobile and the base station. In GSM, one carrier frequency is divided into eight time slots. Each time slot provides one physical channel, which can be assigned to one link between a mobile and a base station. The communication between the mobile and the base station occurs in bursts inside the assigned time slot. Each burst lasts about 577 ms. When frequency hopping is used, the carrier frequency may be changed between each consecutive TDMA frame. This means that for each connection the change of the frequency may happen between every burst. This is called Slow Frequency Hopping (SFH), because more than one bit is transmitted using the same frequency. 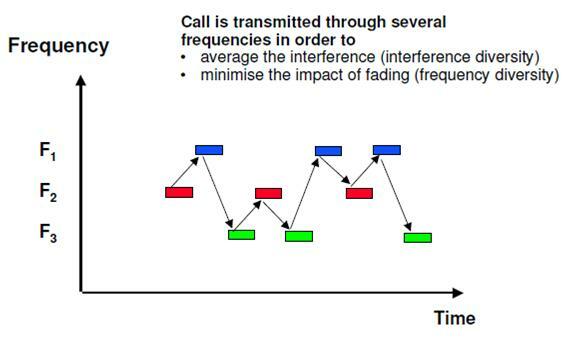 In Fast Frequency Hopping (FFH), the carrier frequency is allowed to change more than once during a bit duration, but this is not implemented in GSM At first, the frequency hopping was used in military applications in order to improve the secrecy and to make the system more robust against jamming. In cellular network, the frequency hopping also provides some additional benefits such as frequency diversity and interference diversity. The basic principle of frequency hopping is presented in Upper Figure. 26 queries in 0.352 seconds.